This was our first, intuitive reaction. We were about to travel to Thailand with our kids (5 and 8 years old) and our first stop was, no surprise, Bangkok. 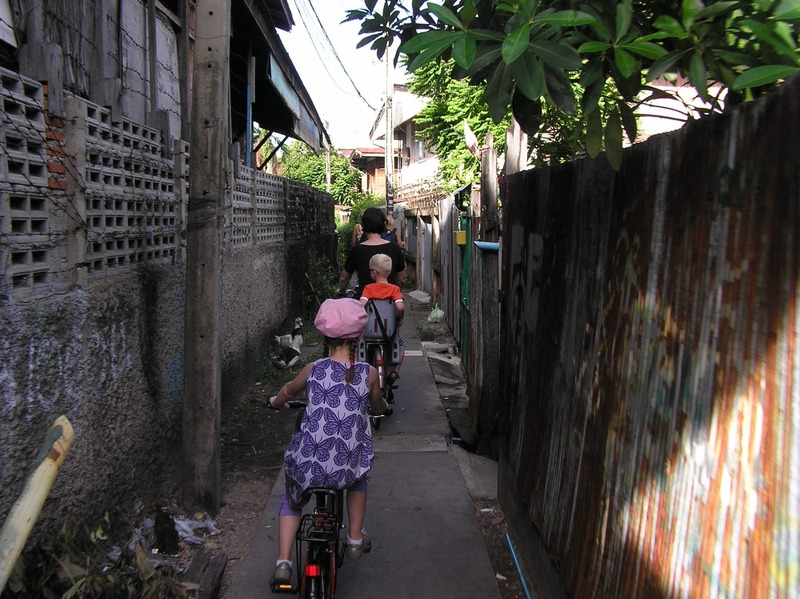 This post shows you one of the best ways to discover Bangkok: on a bike! And yes, it is also very recommendable if you travel with children. This was our second, intuitive reaction right after we finished our 3-hour Bangkok bicycle tour. 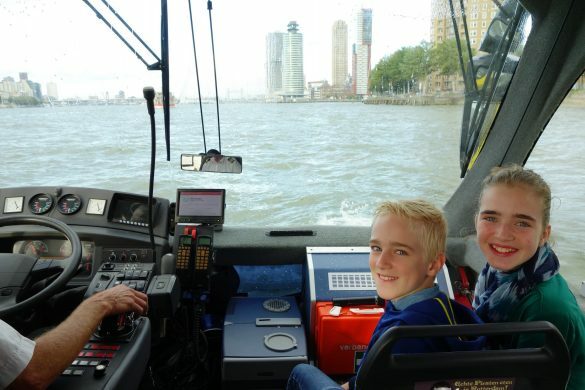 Yes, we are Dutch. We are famous for our bicycle mania. 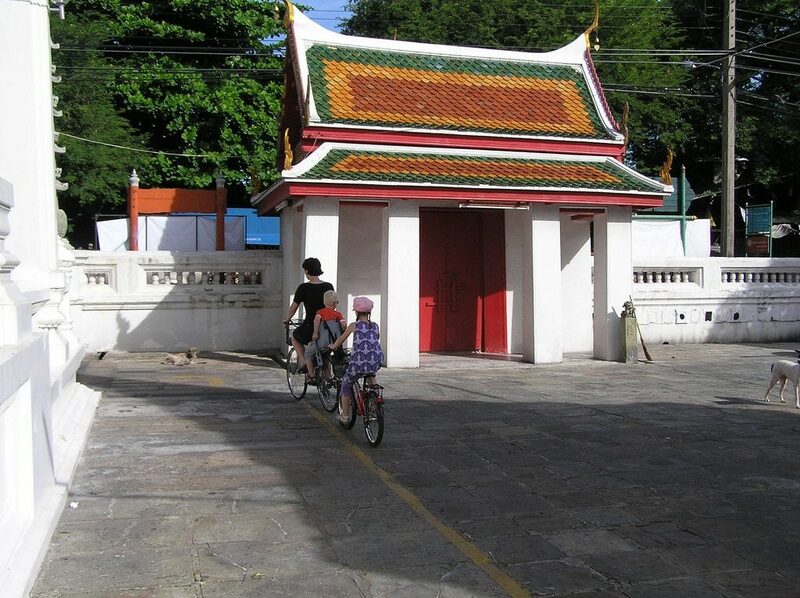 So why not go and discover Bangkok by bike? 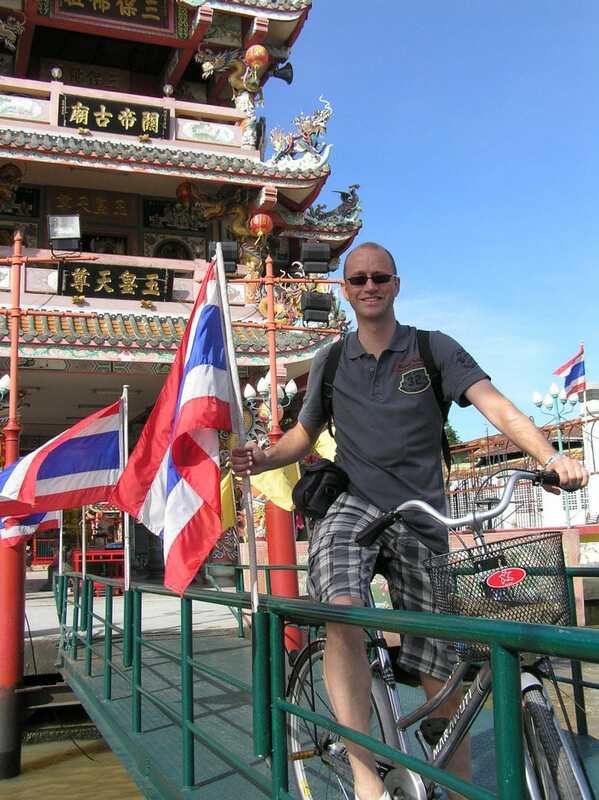 It should come as no surprise that a Dutchman came up with the brilliant idea to organize bike tours throughout the city of Bangkok. And when you ask me to give you one best travel tip for Bangkok, this is it! Go cycling! 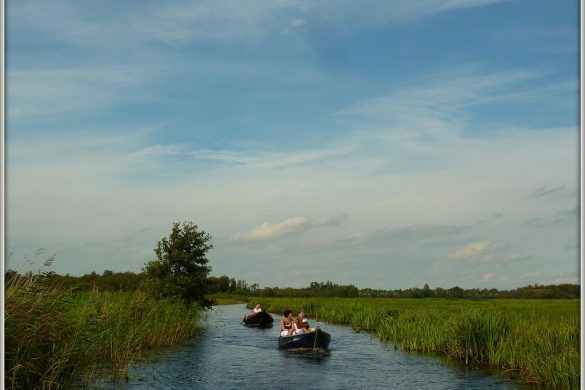 While cycling you will get a glimpse of not only the bustling city life, but also the green outskirts of Bangkok. 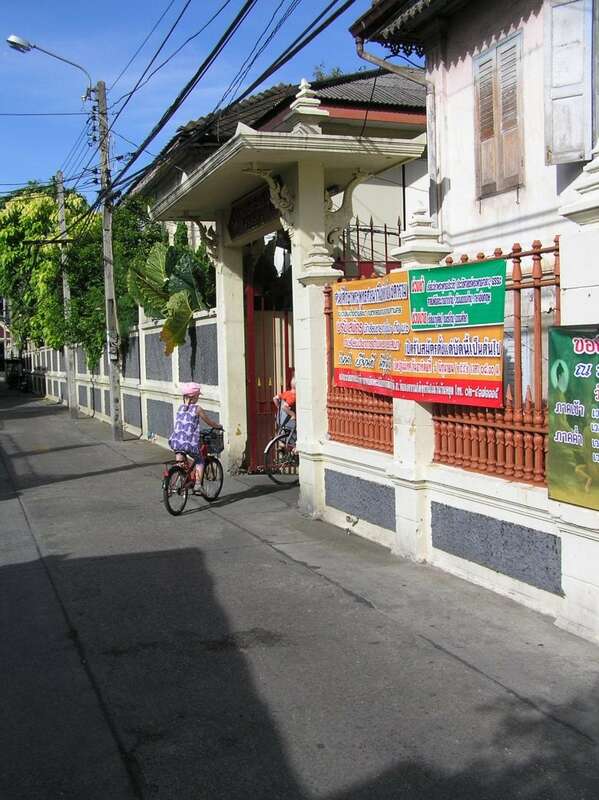 Just outside the city center, across the Chao Phraya river, you can find peace and quiet. This is Thonburi area, small canals surrounded by forest. Here the people from Bangkok go when they want to escape the city for a while. Cycling is a feast for all your senses: you can see, smell and hear the city. Every corner you take will make you experience a new part of Bangkok. This we shouted at least a dozen times when touring the narrow alleys of Bangkok’s Chinatown. Bangkok is a maze of narrow streets, full of corners and hidden entrances. You can quickly lose sight of the person cycling in front of you. Luckily with every corner you take, you will get them in your sight again. And lose them again..
A lot of food is prepared outside in Chinatown. We started cycling around 7am in the morning and the streets of Chinatown were already packed with people carrying goods to their stores and people preparing food on the street. The smell of seasoned meat, soup and baked bread filled our nose. And as we went through this one alley, covered by roof plates and so narrow we could hardly pass the pans of soup and curry, my son shouted his famous words “We are cycling in someone’s kitchen!”. This was so much fun! After Chinatown’s heat we passed on to the coolness of the Chao Phraya river. The river cuts Bangkok in two, and is a great way to travel the city. After crossing the river, we spent the next hour cycling through the green area of Bangkok. A longtail boat dropped us with our bikes. Our children loved the river! It’s Thailand’s main route of distribution, so many large ships pass by. Also, you can watch a cross-cut of Bangkok’s population using the ferries to cross the river. 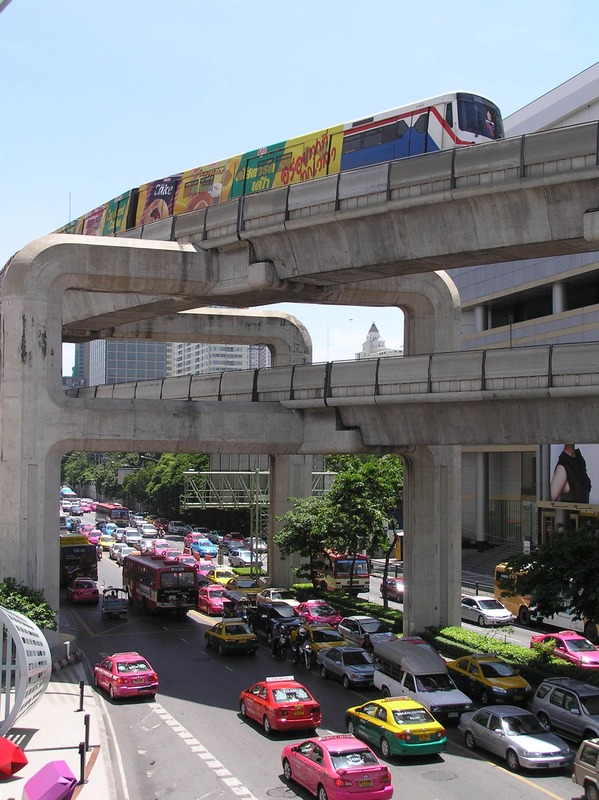 Monks, families, business men; just sit down and watch Bangkok pass by you and your children. On the other side of the river, in the so-called klongs, you and your children will be surprised. 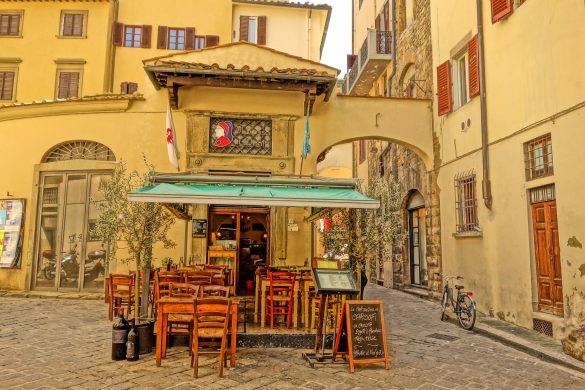 Here you can enjoy peace and quiet, very well received after the bustling downtown experience. 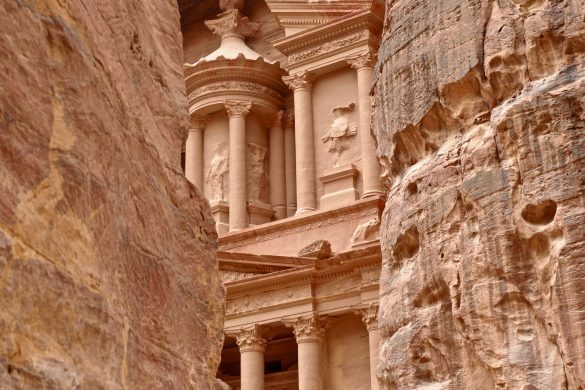 Children run out of their houses to greet you, a monk raises his head sitting in front of his small temple, dozens of fish seem to jump out of the river when you only mimic throwing some bread in the water…. Our tour was a true Bangkok Experience. 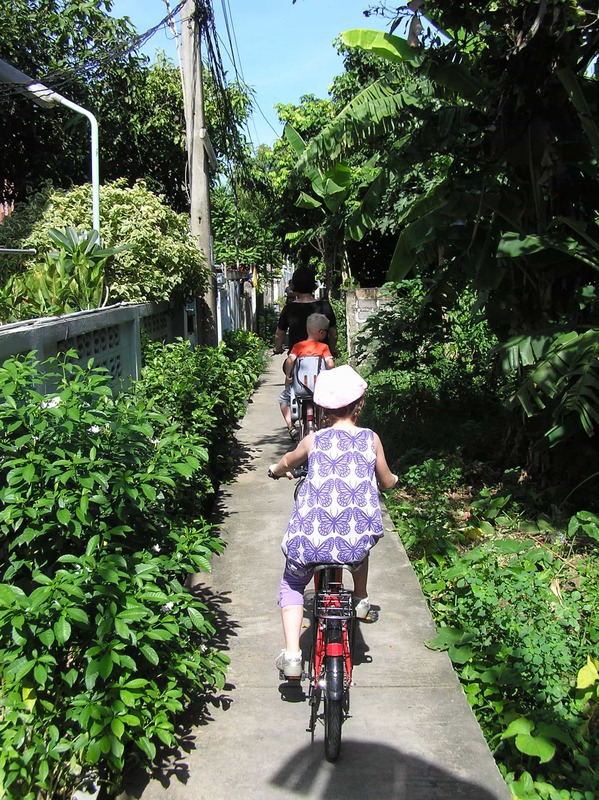 Of course we also visited the MBK shopping centre, the Royal Palace, the lying Buddha at Wat Pho, and other landmarks, but the bycicle tour showed us the real life and the undiscovered territories of the city. I would do it again next time we visit Bangkok. Interested? 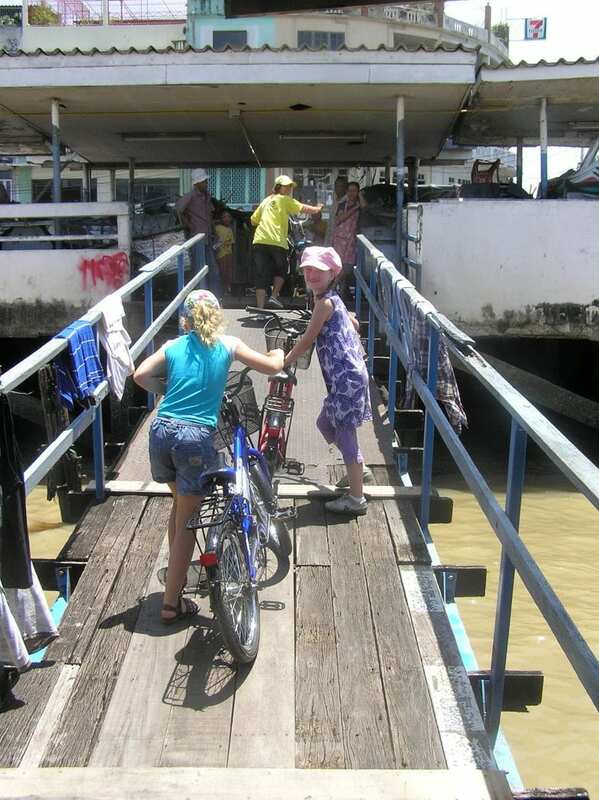 Visit the website of Co van Kessel for the ultimate Bike Tour Bangkok. Wow how inspiring! 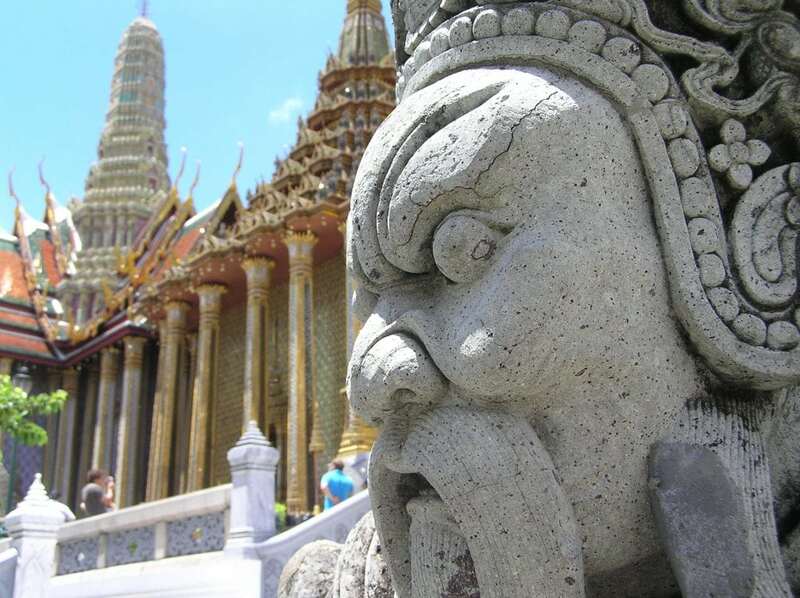 We are a family from New Zealand – 3 kids 5,7,9 planning on a Thailand trip at the end of this year – i am very happy to have found your website to gain handy tips!! just one question – didi your 5 year old ride on the back of an adults bike for this trip? Thanks for your comment and great to hear that you will be visiting Thailand. 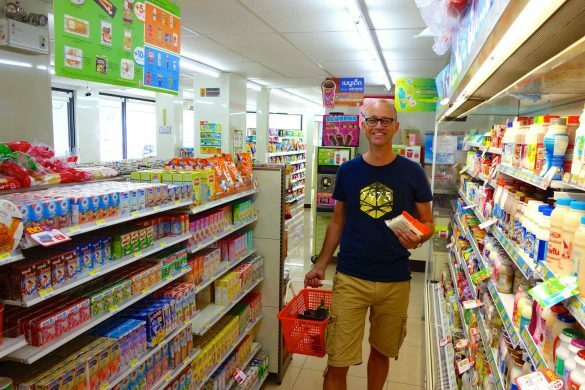 Have you been to Asia before with your kids? Our 5 year old did indeed ride on the back of our bike, he was just too small to ride his own. Our 8 year old daughter had her own bike, no problem with that. Kids have to be able to manoeuvre through the alleys. 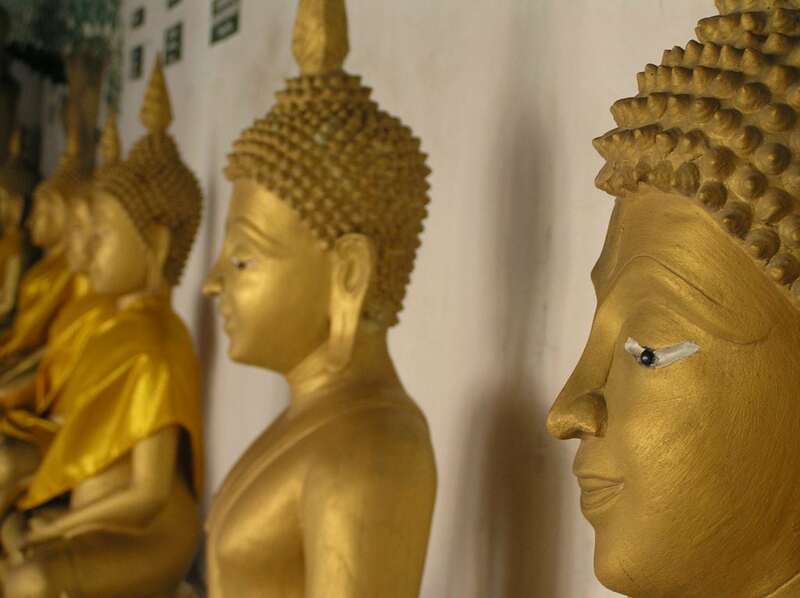 The bike trip is absolutely worth it, great way to visit the hidden sights of Bangkok. 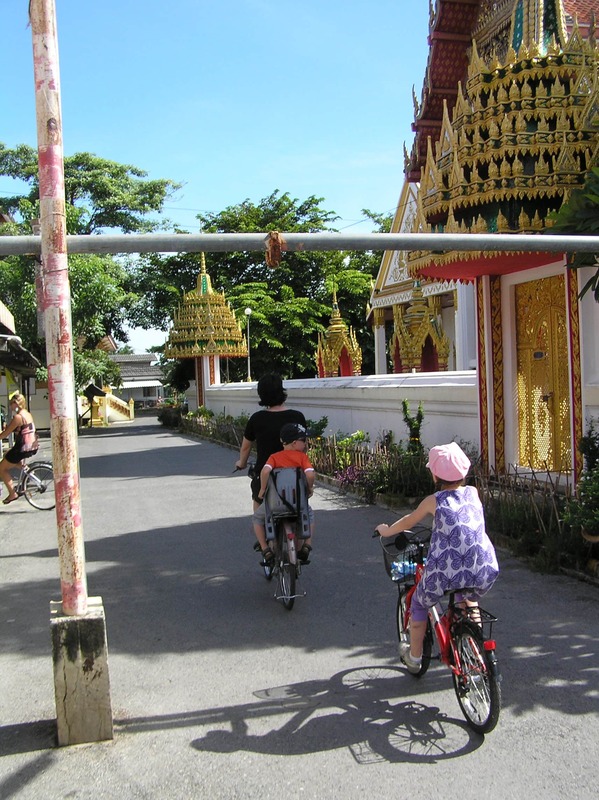 We will be visiting Bangkok and Thailand again this summer and chances are big we will go for a bike trip again! 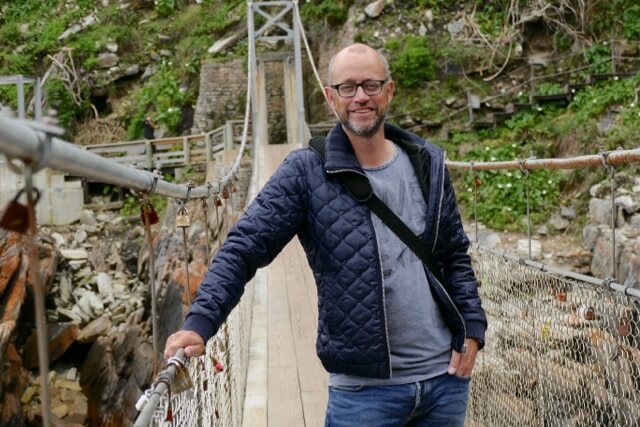 Absolute BEAUTIFUL post, Emiel!! You’re right, this didn’t get the attention it deserved! You’re children are so blessed to have parents that show them the world in a very hands-on sort of way. Gracias Michelle! Appreciate your comment. Biking is hands-on and so close to what our kids do every day…it’s liking coming home in a foreign country I guess..
Good to read your comments and the pics, of course. 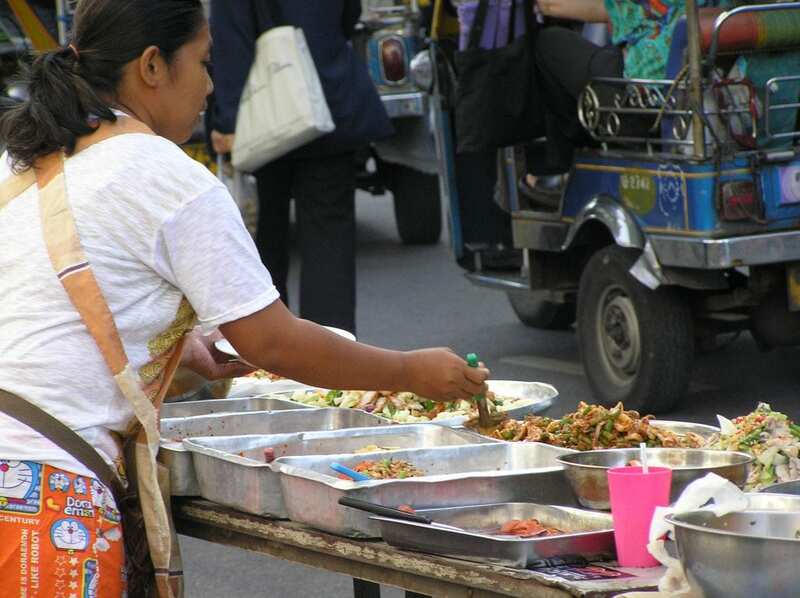 Indeed our tours give you a good insight in unknown Bangkok. So many join for second times and indeed allways a bit of different routings, boats, ferries etc. Thanks for your lovely comment, you run a great Bangkok experience!